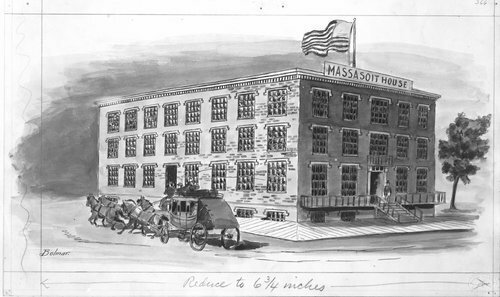 An illustration of the Massasoit House in Atchison, Kansas copied from the book "The Overland Trail". The four-story structure was completed in September of 1856 at the northwest corner of 2nd and Main Street in Atchison, Kansas. The hotel became an Atchison landmark when Abraham Lincoln checked in on December 2, 1859, as he traveled throughout northeast Kansas discussing the issues and concerns of slavery in the territory. The hotel was later destroyed by fire on September 1, 1873.